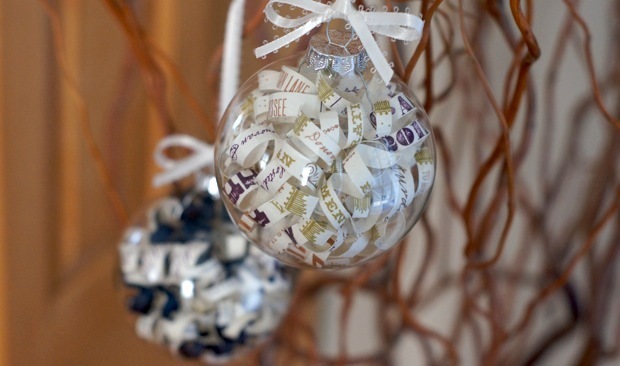 welcome to my new favorite craft — turning an invitation into a keepsake ornament. i stumbled across this craft over at pinterest + knew that it would be a great use for one of the leftover invitations from our surprise wedding. (you can find me here on pinterest if you want to follow me). so, i picked up a four-pack of clear glass bulb ornaments + a bit of ivory ribbon at michael’s, then headed home. 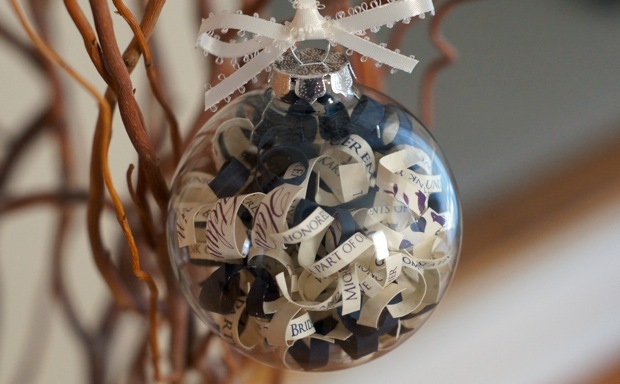 i cut our invitation into roughly 1/4” strips, wrapped each strip around a pencil to give it that pretty curl, then dropped it into the glass ornament. when the bulb was filled, i used tweezers to spin a few of the curls around so key words showed – nashville, love, friends, family, 2011 + our names, for example. i was absolutely floored with the gorgeous + chic result (pictured below). i immediately wanted to make another, + luckily, my friend heather had married a couple months before + i had saved her save-the-date, wedding invitation + wedding program in the hopes of making her something special. so, i made her two ornaments – one (pictured above) uses parts of both her wedding program + her wedding invitation. since her + her husband’s faith was a huge part of their ceremony, i highlighted a lot of faith-related words in her ornament, as well as traditional words like bride, groom, ceremony, etc. again, it turned out amazing! i also made her one with their fab save-the-dates, which had lovely red, blue, + golden tones. i didn’t have time to get a picture because i hurried to leave these as a surprise delivery yesterday, so she could see them in person before she saw them posted here. trust me, it turned out just perfect! so, if you’re looking for a great use for that invitation or announcement you’ve been hanging on to, look no further. i promise you that the results are absolutely charming + make a great keepsake! Adorable! What a great, unique, sentimental ornament!! Brilliant gift for newlyweds! Beautiful and such a nice gift to give to celebrate a special time from earlier in the year at Christmas. What a brilliant, special idea! I still have a few of our wedding invitations tucked away; guess I’m going to have to track one down to make these. LOVE IT! ooh, i can’t wait to see how yours turn out! if you don’t have enough time to get it done with the holidays coming up + the little kiddo to take care of, i definitely don’t mind making one (or more) for you. just let me know! Oh, you are soooo sweet! You might be sorry you made that offer! i was so glad to hear that y’all loved ’em. you are more than welcome — can’t wait to hang out with you two again soon! I love this! They came out so well. thanks, margs! it’s nice to have a little something to look at during the holidays to remind us of our special day, you know? also, i just realized that my reply makes it sound like i’m talking about *our* wedding, not my wedding to my husband. ha! What a cute idea! And the ornament actually looks really cool! ha, thanks jess! i was worried that the ornament would be sentimental, but wouldn’t turn out looking very good. thankfully, it turned out cute! I use the same clear ornament, take a picture of whatever you want and copy it onto trasparency film, cut it in a circle to fit inside the ornament (cutting it to fit inside the ornament is the tricky part cause it has to be able to stand up). Its beautiful cause you can see through the picture. what a wonderful idea, kathy! i think it would be lovely to give two to newlyweds – one with the invitation curls + one with a picture. thanks for sharing the awesome idea! I love this idea! We got married 3 years ago, but I still have an invitation sitting at the bottom of a box. This will be a great ornament to treasure for many years! yay, looks like you’ll have a use for some of those leftover invitations! they’d make a great little gift for the in-laws as well! What an awesome idea!! I am so NOT crafty, but I think I could even make this gorgeous ornament! 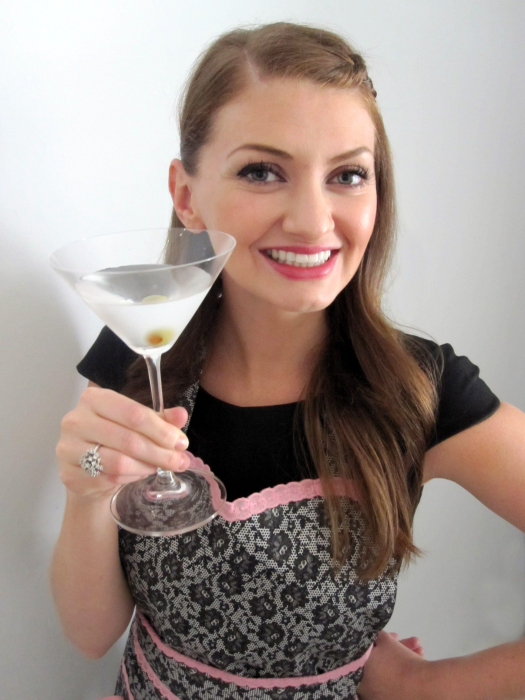 Amy this is such a simple, elegant and GORGEOUS idea! such a great idea for gifting…. thank you so much! i totally hear you on the size issue – i bet we could find some teeny clear ornaments to make mini version for NYC apartment trees. and as we all know, when you make anything miniaturized, it’s even cuter! Question: what size ornament did you use? Hi Kim, I used a 100 mm ornament, which was the only size option at the Michael’s I went to. If you’re buying online, there’s a whole range of sizes. Hope that helps!